Filthy lucre? Cash isn’t the only payment method covered in germs. Credit cards, payment tablets and ATM keypads carry bacteria that cause illnesses, a study by CreditCards.com and the University of Texas at Austin has found. Some of the nastiest bugs found on the surfaces of the payment methods studied included Staphylococcus aureus– the culprit behind staph infections – and Salmonella enterica, a common source of food poisoning. Nevertheless, the average healthy person is unlikely to get sick just by swiping plastic or tapping a tip selection. The study was conducted by University of Texas student researchers, who analyzed samples from payment methods that were swabbed by 30 data collectors from all over the U.S. from March to May 2018. See survey methodology. Scary bacteria often cling to cards. Credit cards led all payment methods in the detection of a few particularly infamous bacterial species. Those included well-known food poisoners Escherichia coli and Salmonella enterica. But E. coli is highly unlikely to appear on any payment method, according to our study. Staph-causing bugs are all over our wallets. Our study showed all payment methods have a strong likelihood of carrying Staphylococcus aureus. All plastic and metal credit cards in this study had detectable amounts of this bacteria on their surfaces. Germ-fearing card users may want to switch to metal. The results of the study suggest metal cards may be less hospitable to different types of bacteria than plastic ones. However, the sample size of metal cards was relatively small, and all metal cards aren’t made of the same materials. A food truck’s tablet may be cleaner than your card. Credit cards are nearly three times as likely to carry the bacteria that causes salmonella poisoning than payment tablets. Coins and cash are only slightly more likely than tablets to carry it. However, tablets are the payment method most likely to carry Streptococcus pneumonia, which can cause pneumonia and meningitis. 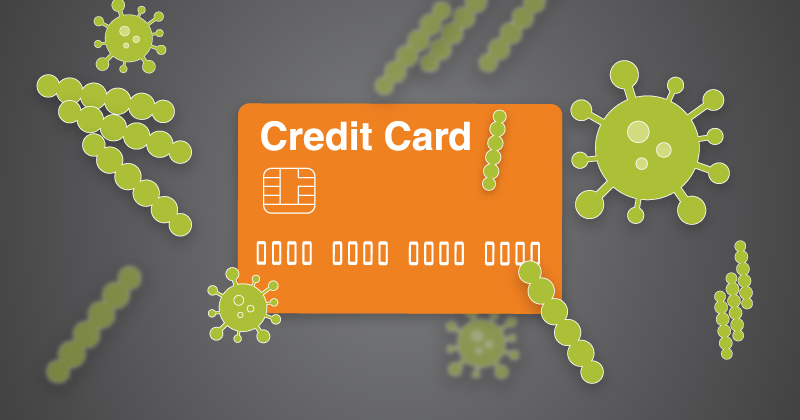 Our study of credit cards and other payment methods found more than 3,000 different types of bacteria, including some that cause pneumonia, strep throat, boils and many other unpleasant conditions. Does this mean you should wear gloves while handling your cards and douse yourself with hand sanitizer after swiping a food truck’s iPad screen? Experts say that despite the presence of scary bacteria on our currency, there’s likely not enough of it to make the average person sick. David Westenberg, associate professor of biological sciences at Missouri University of Science and Technology, said that while cash, cards and tablets can pick up bacteria from human skin, the microbes can’t thrive there because there’s no food source. Nearly every swabbed item in our study showed the presence of Staphylococcus aureus, which, according to the Mayo Clinic, can lead to such maladies as impetigo, blood poisoning, septic arthritis and a MRSA infection. But the abundance of staph has more to do with the ubiquity of the bacteria on your body than where your credit card has been. Westenberg said even someone with a weak immune system – due to old age, disease or chemotherapy, for instance – can avoid bacteria-related illnesses through good hygiene. "STAPH AUREUS IS A VERY COMMONLY FOUND ORGANISM ON THE SKIN OF HUMANS. BECAUSE IT LIVES ON THE SKIN OF HUMANS, IT'S NOT SURPRISING TO FIND IT TRANSFERRING TO THINGS THEY TOUCH." If the thought of coming into contact with bacteria on your card makes you queasy, there are simple ways to minimize your exposure. Miryam Wahrman, a biology professor at William Paterson University and author of “The Hand Book: Surviving in a Germ-Filled World,” recommends keeping your credit cards in a dedicated spot in your wallet or purse. She also suggests cleaning your hands with soap or hand sanitizer if you’ve just touched your card and you’re about to eat something. Westenberg also suggests periodically cleaning your card with antibacterial wipes if you want a little extra protection. Even germaphobes can breathe easier nowadays as fewer people are handling each other’s credit cards. Swipe-and-dip machines and contactless payment technology have reduced the need for store clerks to touch consumers’ cards. Of course, if you pay with a rewards credit card at a restaurant or a bar, it will likely be handled by a server or a bartender whose most recent handwashing is not known to you. But you might still be more at risk when you take out your cellphone to pay your card balance or check for Venmo payments from your dining and drinking buddies. However, that depends on where you tend to take out your phone. There’s little reason to panic about paying with plastic. If you’re healthy and you wash your hands regularly, you can tap, swipe and dip without fear of an emergency room trip. Thirty data collectors from all over the U.S. each swabbed six different payment methods – the first dollar bill in their wallet, a quarter, their go-to credit card, their second-most-used credit card, the ATM keypad where they get cash and a tablet reader such as those common at restaurants, coffee shops and food trucks. CreditCards.com contracted with the University of Texas (UT) at Austin and its Freshman Research Initiative (FRI) to create the germ-swabbing study, protocols and surveys for the data collectors. Timothy Riedel, assistant clinical professor and research educator at the FRI, and a team of four undergraduate researchers created the study. Once collected from the payment methods, the samples were run through DNA analysis to check for bacterial DNA at the on-campus Genomic Sequencing and Analysis Facility. These DNA sequences were compared to a database of known bacterial species DNA, and over 3,000 different species were identified in this study. The resulting data were then analyzed by Riedel, the student researchers and an on-campus bioinformatics data consultant.